This road loop traverses some of the most beautiful inland parts of Marin County (check out the photos if you don't believe me) as well as including a very scenic coastal stretch of Highway 1. Much of this area is used as grazing land by dairy farms and, for that reason, a lot of the scenery along the inland part of this ride resembles a model railroad set featuring improbably pretty rolling hills with the recently mowed appearance of the green grass resembling velvet upholstery (at least until it turns yellow around late April). It must be to these cows that we owe the fact that these slopes aren't taken over by, say, chaparral. Of course, this doesn't mean that the landscape isn't further ornamented with sprinklings of oaks here and there, and clusters of trees around creek beds and ravines. These parts of Marin County are full of country roads with little traffic criss-crossing a sparsely populated cute landscape dotted with ranches and not much else, featuring a varied terrain with rounded hills and picturesque rocky outcrops. Consequently, any route that you follow through this area would make for a very nice road ride. The ride on this page is one such possibility and it's distinctive enough to feature a nickname not borrowed from one of the road or town names along the route. The name comes from the Marin French Cheese company, which all incarnations of this ride pass by, and many of which actually use as a starting point (as does this particular ride). Even this facility's own sign advertises itself as "The Cheese Factory", in addition to their formal name. This route is not the only loop that everyone thinks of when "The Cheese Factory Loop" is mentioned and, of course, any loop in this area that passes by this factory can rightfully be called this. Some popular alternatives by the same name I've noticed online are rides that start around San Rafael, Fairfax, or Novato, reach as far northwest as The Cheese Factory, and then turn back southeast to complete a loop. However, I've encountered a few books and online sources that refer to the route shown on this page as "The Cheese Factory Loop", and since I like the fact that this ride traverses less populated areas, for practical purposes, I'll pretend that this is the "original" version of this named ride. 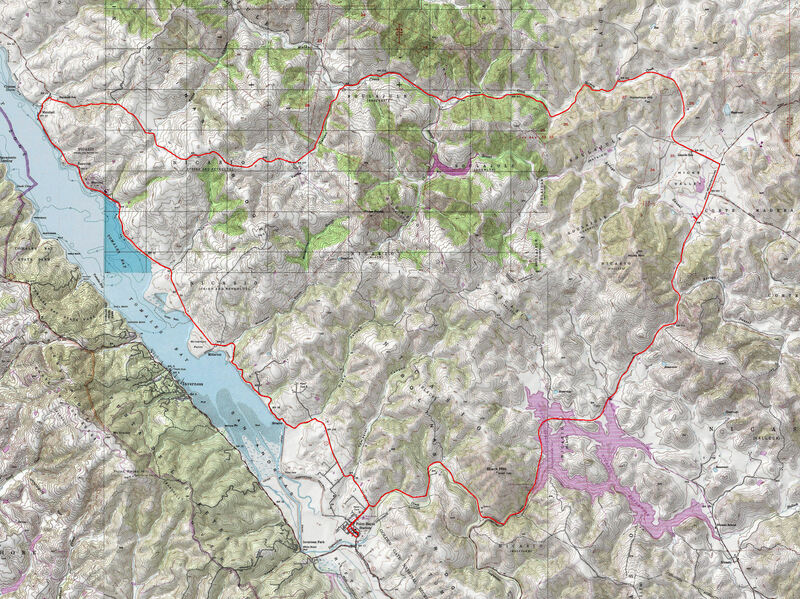 One interesting observation will demonstrate the remoteness of this route pretty well: There is not one public road that bisects the 26,000-acre area encircled by this loop! In other words, this route is the shortest counter-clockwise road loop you can traverse when you start by heading north from The Cheese Factory. This is astounding, when you consider that the starting point of this loop is only a 15-minute drive away from the very busy Highway 101. Notice that the ride starts from the parking lot of Marin French Cheese itself, which is the private parking lot of a business. I've explicitly asked an employee there about this, and she said they're perfectly okay with people parking there for a bike ride as long as they make a purchase there after the ride. This sounds fair to me and actually works out very nicely, because this place has beautiful grounds where picnicking is allowed and they have a store where they sell their own products along with other good food such as a variety of breads, (I believe) wine, other drinks, as well as pre-packaged sandwiches. So, having this available to you right at the end of your ride where you can finish off with a nice lunch sitting at shaded picnic tables overlooking the facility's cute pond would be a perfect scenario. If you can't spare the time for a post-ride lunch, you can still find a variety of packaged deli fare as well as (obviously) cheese that you can purchase and take home, in order fulfill your "parking obligation". Their store is open until 5:00 PM. I should add that The Cheese Factory also seems to provide visitor tours of the facility. Those who would still prefer completely free parking may find the closest option right at the intersection of Novato Boulevard and Point Reyes - Petaluma Road, about a half mile from The Cheese Factory. There is a wide gravel shoulder on either side of Novato Boulevard adjacent to that intersection and I saw no sign there that says "no parking". The loop is also within riding distance from Novato and Petaluma if you live in one of those communities or prefer to park there, but keep in mind that this will extend your total ride length to something like 45 miles. Overall, I find that this ride is on the easy side with not too many serious climbs. There are only two significant climbs to consider. The first of these is the worst one of the ride and arrives on your way to the coast, shortly before you reach Marshall. This 1.5-mile climb is broken into two portions by a quarter-mile flattish section. About 0.4 miles of the first part of this climb is the worst of all and averages a quite even 11% grade. The shorter portion after the flat area has a less even slope and rarely exceeds 9% grade at its worst. I've seen one written description that refers to this overall climb (predictably) as "The Wall". The only other noteworthy climb, unfortunately, arrives right near the end of the ride, when you're most likely to be getting tired. Thankfully, its average slope (at a touch over 8%) is much more merciful than the first one and it's over in a little over half a mile, though the early stretches do hover around 13% for a very short while. In the end, this second climb is nothing to write home about, and you're left with very little pedaling for the brief remainder of the ride once you've crested it. In case you're wondering, one distinct advantage I find in doing this loop counter-clockwise is the fact that this places you closer to the water along the few stretches on Highway 1 where the road is right at the edge of the water, as well as along the segment adjacent to Nicasio Reservoir. It's a bonus that this also means you have less climbing to do over the highest point of the ride near Marshall. You need to gain less than 500 feet of net elevation to make it to Marshall in this direction, but you'd need to gain about 750 feet if you did the loop clockwise. Most roads along this ride share the same character. They are not too narrow, the pavement is mostly well-maintained, but the paved shoulder is rarely wider than six or eight inches. Still, even if you had to ride right on the white line that marks the edge of the traffic lane, you'd still have unbroken asphalt under your wheels for the vast majority of the ride. The only exception to the narrow shoulder (other than sporradic spots here and there) is the three-mile segment on Point Reyes - Petaluma Road between the intersection with Platform Bridge Road and the intersection with Nicasio Valley Road. This short stretch has a generous paved shoulder. In terms of the amount of traffic, Marshall-Petaluma Road features very light traffic and is the quietest portion of this loop, in general. Naturally, Highway 1 has moderately heavy traffic, at least on nice weekends, though you could expect its traffic to be significantly lighter on weekdays. I found that the traffic on Point Reyes - Petaluma Road, perhaps surprisingly, was no lighter than Highway 1 on the day I did this ride. I think that the portion of Highway 1 traversed on this loop is one of the calmest and prettiest stretches of this road. You'll be passing through two small towns (Marshall and Point Reyes Station) as well as a few other even smaller hamlets that you wouldn't notice if it weren't for the fact that they're marked on the map, and that appear to be little more than a few houses clustered around a shellfish restaurant and (sometimes) a pier or two. Of course, shellfish is a major product of Tomales Bay and you'll, therefore, pass by a number of very popular eateries serving barbecued oysters (and all other forms) as well as crabs, shrimp, etc. Some of the places you'll pass by in this part of the ride are somewhat reminiscent of the type of small fishing settlements you'd expect to find in New England. Note that the main loop passes right by the outskirts of Point Reyes Station without entering it. However, it's highly recommended that you take a brief side trip to check out the charming three- or four-block main street of this small town (as the route plot shown above does). This is the largest town you'll be encountering on this ride, and it provides ample opportunities for food, drinks, rest, or replenishing supplies, not to mention the fact that it also seems to feature a decent bike shop (Black Mountain Cycles). One last side note is about an interesting type of roadside attraction that you'll encounter on this loop (and other similar loops in Marin): tiny historic schoolhouses. You'll pass by at least two of these on this loop: The one-room Lincoln School on Hicks Valley Road, near the beginning of the ride, and the similar Marshall School in Marshall, both date from the 19th century and, along with the cute red St. Helen Catholic Church, which is similarly right by the road in Marshall, add to the historic charm of the ride.